 Savvy, anecdotal perspectives on the mercenary aspects of professional sport in North America from a pair of Ernst & Young consultants whose clientele encompasses the blue-chip likes of major league baseball's Office of the Commissioner and the NBA. Drawing on their own contacts and a host of secondary sources, the authors offer once-over-lightly rundowns on the complex commercial infrastructure of the top four spectator sports-- baseball, basketball, football, and hockey. Inter alia, they review the megabuck ties that bind broadcasters (in particular, television networks) to sports franchises in the US and Canada. Gorman and Calhoun also assess the varied ways clubs entice fans to arenas and stadiums. Covered as well are the awesome pay gains obtained by journeyman talent in the wake of free agency (which produced equally dramatic hikes in admission tabs), the financial rewards of astutely merchandising club logos, the economic realities of trading superstars (like Wayne Gretsky or Charles Oakley), the sizable outlays required for player development, the companies most likely to sponsor ads on play-by-play broadcasts, and what sort of money it takes to put a team on the field, ice, or court for a single season. 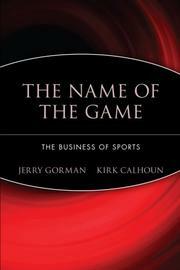 Toward the close of their audit, the authors caution that pro sport's putative partners may be eating seed corn. By way of example, they note fewer families can afford to take children to athletic pleasure domes where a group of four can easily spend $200 or more. To attract the largest possible audiences, moreover, TV insists that championship contests be scheduled in prime time when young fans who represent the future are (or should be) abed. Nor do Gorman and Calhoun hold any brief for franchises (like baseball's San Diego Padres) which rid themselves of popular players to cut payroll costs. An evenhanded reckoning on big-time sport as a business.